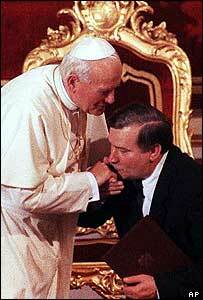 Pope John Paul II was a respected figure worldwide. Even though he was often criticised for his conservative stances in questions like abortion, contraception or gay marriages, he still enjoyed great popularity that can be hardly compared to his predecessors. One factor contributing to his general popularity had been his energetic image as well as the enormous number of trips he made around the globe. John Paul II was also popular in the generally non-religious Czech Republic, even though the reasons for his popularity here may have been slightly different. "This pope has certainly had special importance for Central Europe, for all of Eastern Europe, for the Slavonic countries as well as for the communist and post-communist society in general. It has been one of the greatest merits of John Paul II that the whole Christian Europe started to think much more about the East of Europe." But John Paul II did not appeal only to Catholics in Eastern Europe. As former Czech dissident Jan Urban says, due to his resistance to communism he was also important for many non-religious people. "You know, just the symbolism of the first 'Slavic pope' with a very strong anti-communist stance and, what was important at that time in Czechoslovakia, - anti-Soviet standing - this was encouragement for non-Catholics as well." His election in 1978 not only encouraged the Polish dissident movement but also Czech dissidents who united around the human rights manifesto Charter 77. "One has to remember that his election came in that very dark time after Charter 77 had come into existence and the regime reacted with vicious attacks. Also, very strong element of Charter 77 dissident movement was Catholic - or Christian Democratic as they called themselves later. So the news about a Polish pope came as a great surprise but also as tremendous encouragement." Many of the dissidents believed that John Paul II would have the power to influence totalitarian regimes in Eastern Europe. "I recall talking to known Catholic activist Vaclav Benda after his release from prison and he laughed at the darkest of the dark times claiming: 'This is the end!' I thought: You are dreaming, what are you talking about? OK, it's a Polish pope, it' wonderful... We heard from our Polish friends how important it was for them when we met them at the border in the mountains. They all had stickers and literature about him, but it still felt like a dream." But Martin Horalek says, that the election of John Paul II came as a great surprise even within the Catholic Church itself. John Paul II"It was certainly a huge surprise. I think that most of the people in Italy, in Rome - they didn't expect it. He certainly opened the Church to a very live dialogue about contemporary society. He opened the Church to Eastern Europe, he started a dialogue with the Orthodox Church, and what is also very, very important is that John Paul II opened a very positive dialogue with the Jews and Muslims - what was before his papacy something rather suspicious and unusual in the Vatican." "He came directly after the Velvet Revolution in 1990 and he organized this trip as a very extraordinary visit - which was something very special - and he opened the whole issue of John Hus and the big questions regarding this period of Czech history. So he practically started the four-year process during which historians, theologians and a lot of specialists studied the question of John Hus and this period." But even though John Paul II was very popular among Czech Catholics, and his role in hastening the fall of Communism was widely recognized among former dissidents, not all Czechs looked at all his stances with sympathy. Cardinal Miloslav VlkMan: "I don't agree with his opinions regarding abortion, condoms and so on..."
Man: "Well, I have to say I am an atheist, so I am not very qualified in Christianity. But I know that the pope is a certain symbol and he can achieve many things if he wants. I can imagine that this figure has some sense for believers." Man: "The problem of the Catholic Church - at least for me - is that it is too closed and that it does not reflect the current society. I mean for example the often discussed question of family planning. So in this I see unnecessary conservatism and little respect for the needs of the current society." At the moment there is much speculation about who will come after John Paul II. Many Czech Catholics would like to see Czech Cardinal Miloslav Vlk in the post. But even if - as seems highly improbable - the next Pope were to be from Central Europe, it probably would do little to change most Czechs' rather sceptical attitude towards not just the Catholic Church but organised religion in general. Yet when he was elected in 1978, few outside Poland had heard of Karol Wojtyla, then the archbishop of Krakow. The cardinals who chose him knew they could count on him to uphold traditional beliefs at a time when many Catholics were questioning the teachings of the Church. During his papacy, there has been no wavering in the Vatican's position on contentious social issues such as birth control, abortion and divorce. Neither has the celibacy of the priesthood or the role of women in the church ever come up for discussion. "The next pope is going to have a very difficult time untying things like birth control, abortion and women priests," says Madeleine Bunting. "For example, he has been so categorical that women priests are not acceptable that it will take a long time - decades - for that to be changed gradually." But while John Paul II has been a conservative in terms of doctrine, he has tried to promote social justice, not least in his homeland. As a young man growing up in Poland, Karol Wojtyla witnessed the rise of Nazi Germany. Then after World War Two, he faced the challenge of being a priest in a Communist state. The proactive style of John Paul II has underlined the fact that a pope is not just a spiritual leader; he is also a player on the world's diplomatic stage. He spoke out against the war against Iraq, trying in vain to persuade the United States and Britain to hold back from military action. A major theme of his papacy has been his attempt to reach out to other faiths, in search of reconciliation after centuries of hostility and suspicion. He has travelled to Islamic countries, becoming the first pope to set foot in a mosque. As a gesture of religious tolerance, it took on new meaning after the events of 11 September 2001. Marco Politi, one of Italy's best-known Vatican watchers, believes John Paul II will be remembered not only as a great pope, but also as a leading figure of the 20th Century. "Twenty-five years ago, the pope was an important personality for Catholics, maybe for Christians," he says. "Now he is a spiritual leader accepted and recognised by people of different faiths." They say that during his reign, the Vatican has exercised too much power, and is now less tolerant of dissent. Some want to see a different kind of papacy, with bishops around the world having a greater say in how the Church is run. That would be a challenge to the authority of the Church's central bureaucracy, the Curia. John Wilkins, editor of The Tablet, believes that after John Paul II there may be a change in the relationship between the Pope and the Church outside Rome. "It is a curious paradox of a very centralised papacy that in some ways the Church has never been so open in the direction that it follows now," he says. "John Paul II has laid the foundations for the future. He is the last pope of the 20th Century, rather than the first one of the 21st Century." But whoever eventually succeeds him, he will be a tough act to follow. Father Thomas Reese believes the Pole brought unique skills to the papacy, and whoever succeeds him will not be a carbon copy. "There is no-one like John Paul II," he says with a smile. "We would have to clone him, and the Church is against cloning." His Holiness Pope John Paul II as he visits Communist Poland for the first time since he left decades ago. i was in poland last year and people there have great respect for pope john paul II. The Power of the Holy Mass!